Crowns at Emerald Dental Care are strong, durable and long-lasting. With the adequate care and six monthly maintenance, the dental crown can last many years. Dental bridges are used to restore missing teeth in between two healthy teeth, essentially “bridging” the gap. The teeth on either side of the space are prepared for crowns, and are joined together with artificial teeth to fill the gap. 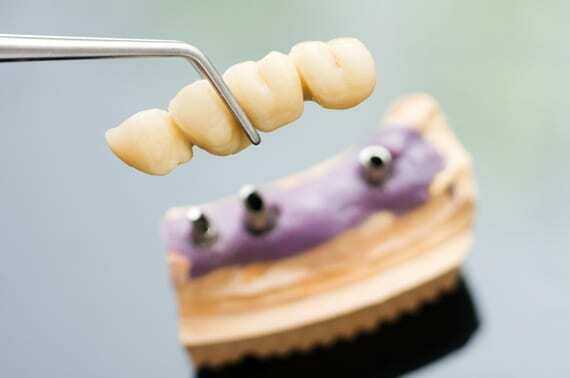 Dental bridges are permanently cemented on and are a popular alternative to removable dentures. Crowns and bridgework typically takes two appointments. At the first appointment, we will prepare the required teeth to allow space for the crown or bridge. Impressions will be taken and sent to a dental laboratory where the crown or bridge is fabricated to fit your teeth perfectly. You will leave with a temporary restoration until the second appointment, where this will be removed and the crown or bridge cemented on permanently. It is most important to restore missing teeth, not only for appearances, but for function and overall dental health. Your teeth are designed to work together, for eating and speaking. Missing teeth can cause unusual stresses on your remaining teeth, increasing your chance of teeth fracturing and gum disease. They can also affect speech as well as having detrimental effects on lip and cheek support, resulting in a more sunken appearance. Additionally, spaces created by missing teeth can result in drifting and rotation of surrounding teeth, potentially causing decay, gum disease and bite problems. Traditional dental bridge: The teeth on either side of the space are prepared for crowns, and are joined together with artificial teeth to fill the gap. Cantilever bridge: Similar to the traditional dental bridge, except the artificial tooth is only fixed to a crown on one side only. Because of this, it is slightly weaker than the traditional bridge. Implant-supported bridge: Similar to the traditional dental bridge, except the bridge is secured and fixed onto implants instead of natural teeth.